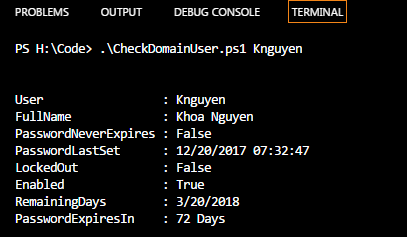 As an end-user that does not support active-directory, I like to know when my password is approaching its expiration date; this is also useful if you have a non-human service account created to automate a process – you wouldn’t want the password for the account to expire without you knowing. 1) The target machine executing this script needs to be able to Import-Module ActiveDirectory. Role Admin Tools > AD DS and AD LDS Tools > Active Directory Module for Windows PowerShell. it from Microsoft - https://www.microsoft.com/en-us/download/confirmation.aspx?id=7887 first. Navigate to script location and execute script with domain username as an argument. #This requires that a domain username is passed into the script during execution, without it, the catch error exception will run. Write-Host "PasswordExpiresIn : $CalculateDays Days`n"
If you wanted to take it further, I’d suggest creating some if/else conditions to evaluate $CalculateDays to email out on remaining days or if account is $LockedOut or not.